The attack panicked students at the school after a lockdown was ordered and they were told to go quietly to their classrooms. 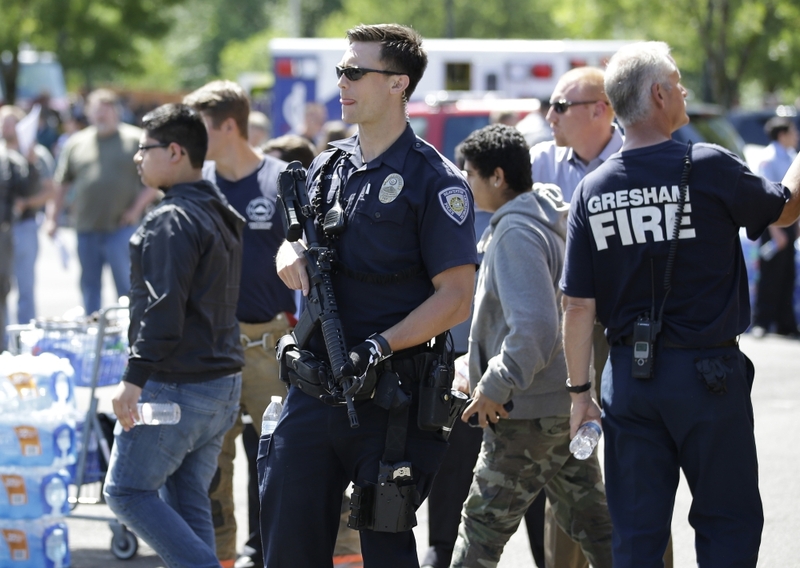 TROUTDALE, Ore. – A teen gunman armed with a rifle shot and killed a student Tuesday and injured a teacher before he likely killed himself at a high school in a quiet Columbia River town in Oregon, authorities said. After the shooting stopped, police spotted the suspect slumped on a toilet in a bathroom at Reynolds High School but couldn’t see what was happening with him. Officers used a robot with a camera to investigate and discovered the suspect was dead and that he had likely killed himself, Troutdale police spokesman Sgt. Carey Kaer said. The victim was identified a 14-year-old freshman Emilio Hoffman, who was “loved by all,” police Chief Scott Anderson said at a Tuesday news conference. He said Emilio was found in the boys’ locker room. Authorities have tentatively identified the gunman but his name is being withheld until his family is notified, Anderson said. The teacher’s injuries weren’t life-threatening, and he was treated at the scene. He was identified as Todd Rispler, a 50-year-old physical education instructor and former track coach and quarterback at the school. Anderson said Rispler went to the office and initiated the school lockdown procedure. The attack panicked students after a lockdown was ordered and they were told to go quietly to their classrooms. Freshman Morgan Rose, 15, said she hunkered down in a locker room with another student and two teachers. “It was scary in the moment. Now knowing everything’s OK, I’m better,” she said. Freshman Daniel DeLong, 15, said after the shooting that he saw a physical education teacher at the school with a bloodied shirt. He said he was texting friends to make sure they were all OK.
Anderson said two on-campus police officers were the first to respond to reports of a shooting. The officers and a tactical team sent to the school “brought this to a conclusion,” the chief said, without elaborating. Anderson said he was sorry for the family of the slain student. “Today is a very tragic day for the city of Troutdale,” the chief said. The first reports of shots fired came at 8 a.m. on the next-to-last-day of classes. Police initially seemed uncertain about whether there was a live shooter in the school. Students were eventually led from the school with hands up or on their heads. 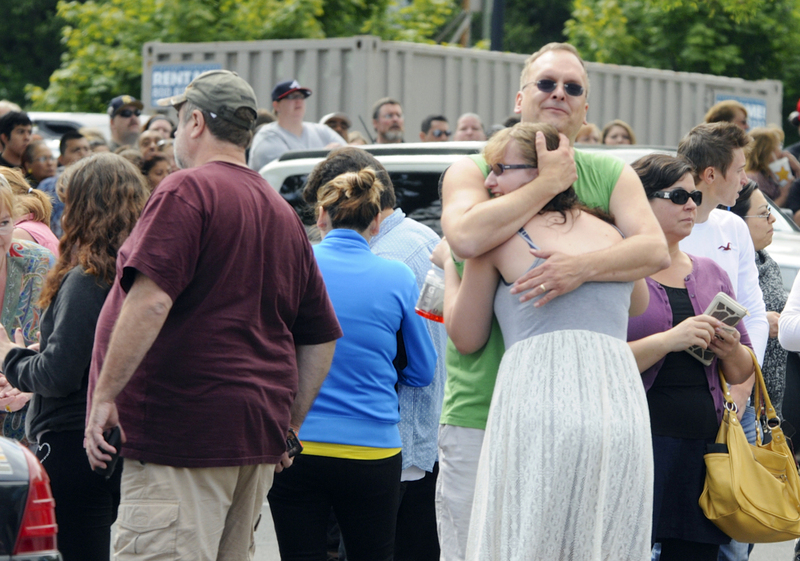 Parents and students were reunited in a supermarket parking lot. Mandy Johnson said her daughter called from a friend’s phone. The Reynolds School District issued a statement mourning the loss of one of its students. Reynolds is the second-largest high school in Oregon, with about 2,800 students. The school is about 15 miles from Portland and its students come from several communities. During the evacuation of the school, authorities found another student with a gun and he was taken into custody. That weapon and arrest were not related to the shooting, Anderson said. The Oregon violence came less than a week after a gunman opened fire on a college campus in neighboring Washington state, killing a 19-year-old man and wounding two others. It follows a string of mass shootings that have disturbed the nation, including one on Sunday in Nevada that left two Las Vegas police officers and a civilian dead. 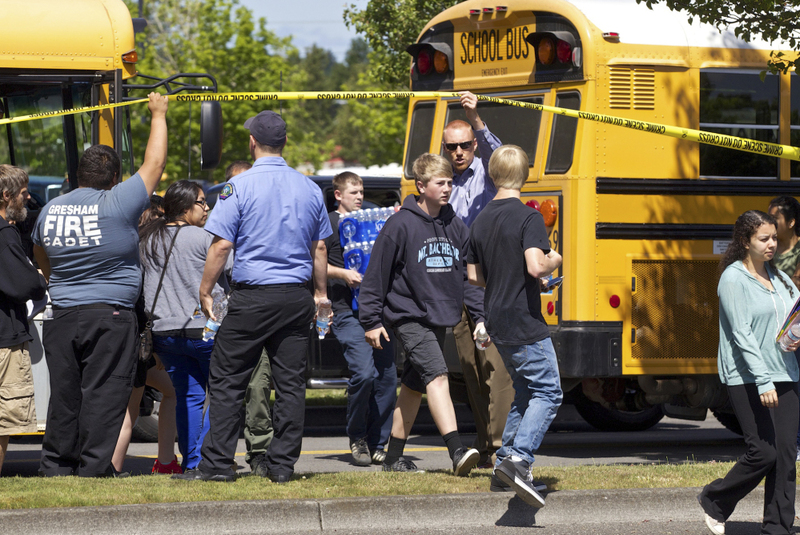 The Tuesday shooting was the first fatal school shooting in Oregon since May 1998 when 15-year-old Kip Kinkel killed two students and wounded 25 others at Thurston High School in Springfield near Eugene. He killed his parents prior to the attack and is serving a 111-year prison sentence.